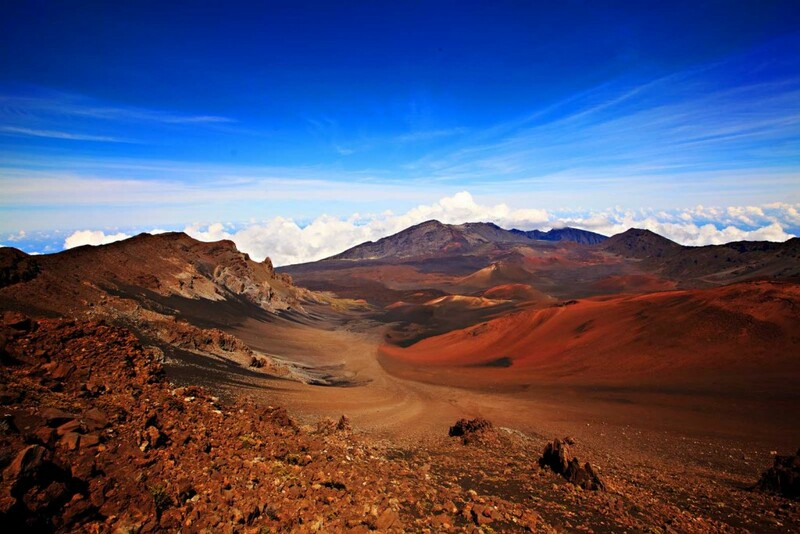 Haleakala, translated “House of the Sun” is a colorful jewel crowning Maui’s summit. Around 10,000 feet above the ocean below, Haleakala mountain stands high above the clouds with panoramic views of the Big Island, West Maui, Lana’i, Kaho’olawe, and Molokini. This unique, seemingly barren land atop an otherwise lush island was once thought to be a volcanic caldera. Today it is thought that instead it is a canyon carved by wind and rain leaving behind only the hardened earth surrounding once active cinder cones. This beautiful picture of Haleakala looks to the northeast, toward the sunrise and the small town of Hana. It can be difficult to take a good picture here with often cold, windy conditions that quickly bring new clouds into and out of the canyon. This spot is a favorite for tour groups and is most often associated with its stunning beauty and unexpectedly frigid temperatures. Many a soul has found themselves huddled next to near strangers as they attempt to stay warm, waiting in freezing temperatures and flip-flops for the sun to rise over the peaks.